How are you using metrics, benchmarks, and experiments to improve your Facebook presence? I launched a Facebook Fan Page for my blog over the summer shortly after Facebook announced vanity urls. I resisted it for a year because I was concerned about having yet another social media outpost to feed and tune. I wanted to avoid automated cross-posting of social content because I think it isn't very effective. What is the way out of this problem? Limited time and resources for maintaining and creating content on one hand, and a desire to get started. The secret sauce: Very focused objectives for your Fan Page and a selective strategy. To create a listening post to understand the questions and concerns from nonprofits about implementing an effective Facebook presence. To engage and discuss techniques and tips for using Facebook effectively for nonprofits. The type of content I share that supports these objectives includes: the best links on strategy and tactics for Facebook, discussion questions, and responding to people's questions. Measuring this requires some surveys of fans as well as counting the number of insights gleaned from posts and discussions from Fans. I have not done this yet. To refine a content strategy, I used the Fan Page insights metrics tool, particularly the stats on interactions and Fan Page growth. My experiments were quite granular: What gets more interactions - sharing video or photos or links? Does sharing link with a 2-sentence commentary work better than sharing with a question? How often do I need to post content to keep fans engaged and attract new fans? The Facebook Insights tool lets you see trends Fan acquisition and subscription. Here are some metrics that I use to harvest insights on those questions. Total Fans / Unsubscribers: Total number of fans over time, overlaid with the total number of fans who have chosen to hide your posts in their News Feed (unsubscribers). New / Removed Fans: The number of people who have become a new fan of your Page or stopped being a fan of your Page. Page Views: Total number of times a Page was viewed per day. Media Consumption: Total photo views, audio plays, and video plays for the content you have uploaded to your Page. Unsubscribes / Re-subscribes: The total number of times fans unsubscribed from your Page, and the total number of times fans re-subscribed to your Page. Over the past few months, I've discovered the formula that works for my fan page. It would be interesting to compare across Fan Pages of other nonprofits - particularly the question of frequency of posting and Fan growth. The M&R social media benchmarks study is a good start, although the benchmarks are based on a small sample size. Sysomos did a benchmarking study of all Fan Pages on Facebook that looked Fan Page "popularity" (number of fans) against content posting frequency. It found that frequency of content posting doesn't no correalate with popularity. I'd love to see a drill down of the M&R Benchmarks and Sysomos metrics for just the nonprofit Fan Pages (vetted to ensure they are nonprofits). One of the members of my Fan Page, Marc Van Bree, shared an interesting link to a new and free analytics tool called Fan Page Analytics created by Pete Warden who also created the Twitter social network analysis tool Mailana. Right now it is limited to three different ways to analyze your Fan Page. 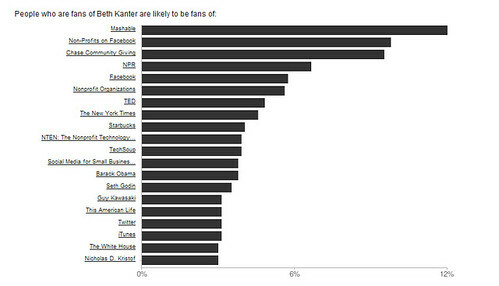 You can what your fans are interested in based on what other Fan Pages they have joined. It also gives you a visual representation of geographic location of fans, but only US distribution. The service is basic and there will be more advanced features. What I'd like to see is a social network analysis of active fans and their relationships with others. This would be useful to help identify influencers. How do you track and measure your Facebook Fan Page against your objectives? How are you using metics and experiments to improve your Facebook Fan Page content strategy? Adding Google Analytics for Facebook Fan Pages has really helped me understand the cross traffic from my nonprofit website and our Facebook Page. You get the best of both worlds with FB Insight (gender, age, ect...) and everything you love about Google Analytics (including visitor statistics, traffic sources, visitor country, keyword searches with all other powerful reporting & maps overlays etc). I look forward to setting up another Analytic goal on FB Pages to notify Google Analytics when someone has opted-in, much like a eNews signup on our current site. This makes a lot of sense to a online marketer, as a new lead is a new lead, no matter where you acquire it. It is then up to you to nurture that lead and convert them into a long term donor. Here is the tutorial on how to set up Google Analytics on your FB Page. Ryan, that looks like a great idea. Do you know if it will work after the upcoming Facebook layout changes? I was under the impression that there would no longer be Boxes in the left-hand column next to the Wall. And to add to the discussion, one thing we have found helpful is to compare the number of new fans in a period to the number of unsubscribes (not removed fans!) in the same period. This gives you a sense of how compelling your posts are and possibly if you are posting too frequently, since most people unsubscribe at the time that they are annoyed by a post in the news feed. Brilliant!! Worth a guest post except I hesitate to make FB aware since they must certainly see Beth’s Blog. Thanks for sharing!